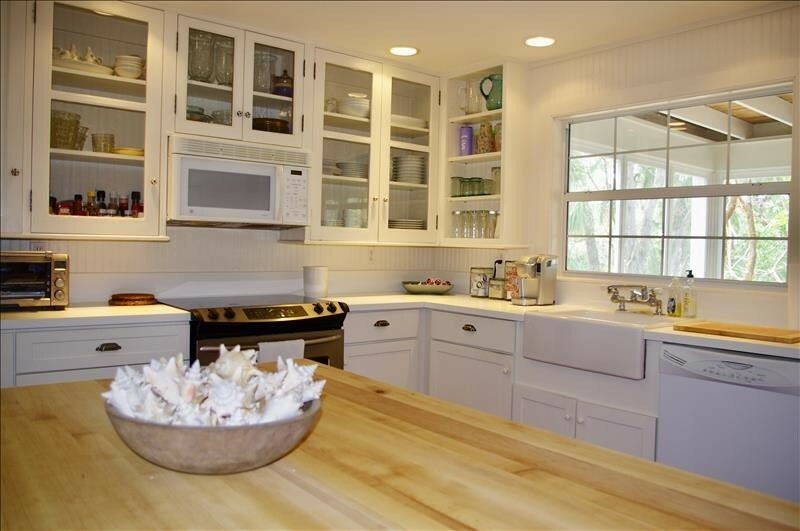 You'll feel like you're Miles Away from the outside world when you settle in to this fabulous Old Florida family home, located just off Island Inn Road. 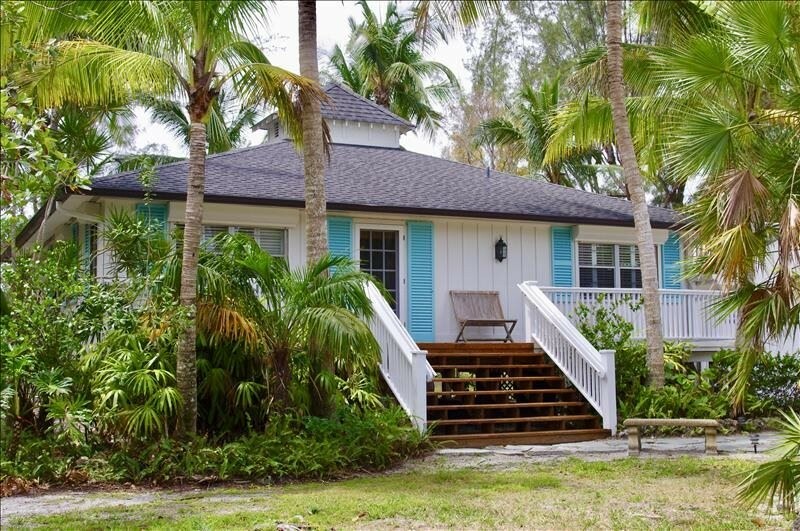 This classic Key West style home is right in the heart of Sanibel, and you'll love its proximity to the beach, as well as Bailey's Grocery, the cinema, Doc Ford's Rum Bar & Grille, as well as the amazing Bailey Tract of the J.N. "Ding" Darling Wildlife Refuge. Miles Away is a cherished family home, and the next generation of the family has updated it with lovely touches such as mahogany floors throughout, an updated farmhouse kitchen, beautiful artwork throughout, an eclectic mix of antique, new and vintage furnishings, and yes, central air conditioning and laundry. Classic details include a spacious screened porch for coffee in the morning or cocktails in the evening breeze, crisp white paint, and a wonderful location that is a 10-minute walk to the goreous Gulf of Mexico beach. 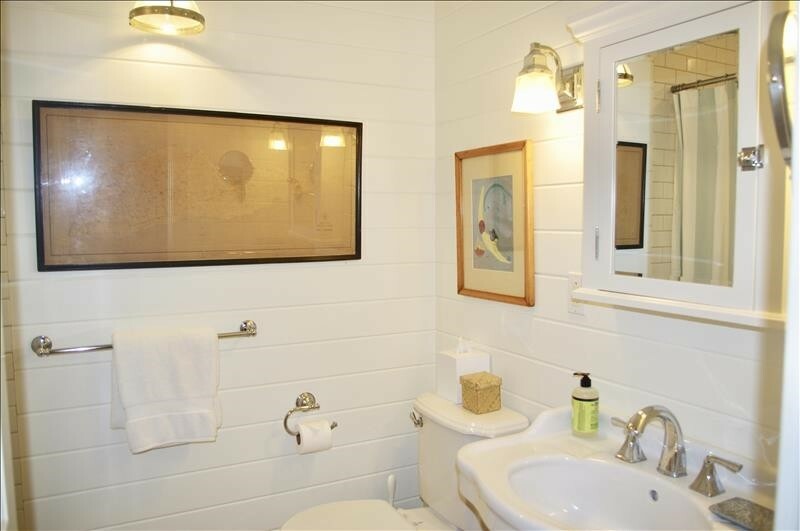 Seashells and special touches can be found everywhere. 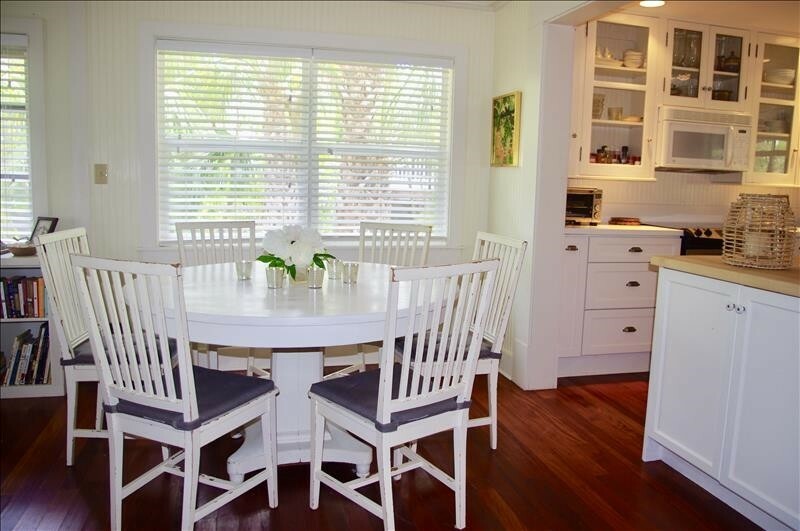 Baskets for your beach towels and flip flops, bowls of collectible shells, the perfect island accessories - this home is simply a delight to explore. 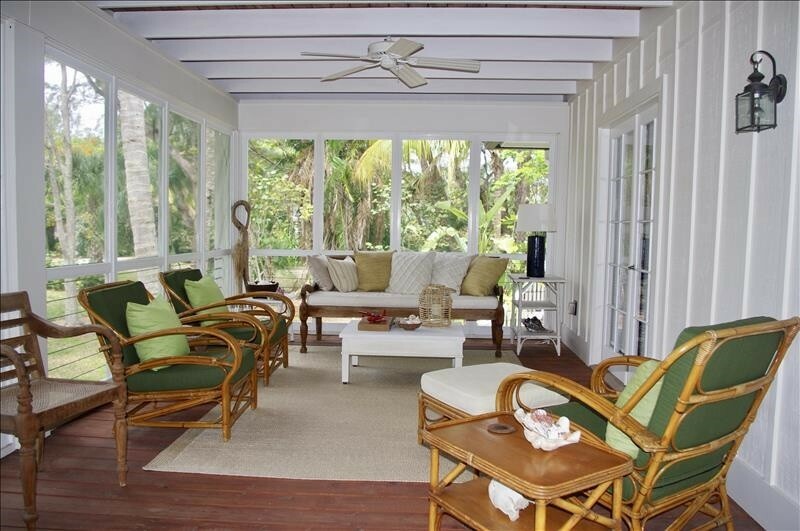 The home features beach and pet-friendly mahogany floors throughout, a spacious living room with built-in bookcases that are a book lovers' dream. Whether you want to read up on birding, shelling, photography or mysteries, Miles Away has a varied collection to pique your interests. In addition, you can while away the days and evenings by streaming music with the state of the art SONOS music system. 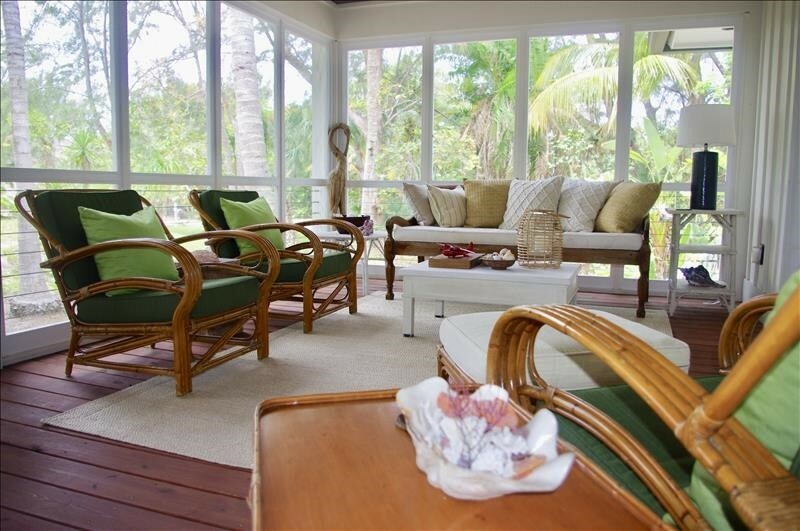 The living room has 2 overstuffed comfy sofas, with seating for 6 -8, a flat panel tv, and garden views. 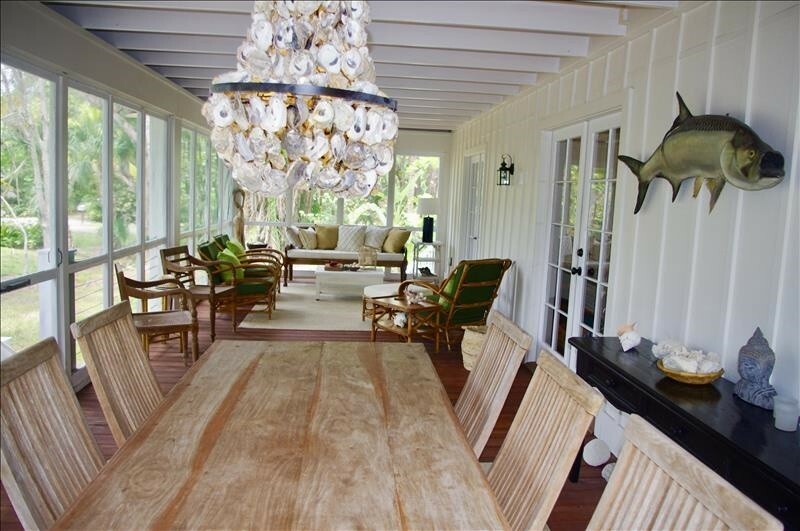 The dining area seats 6, and entertaining is a breeze with the spacious, open floor plan. 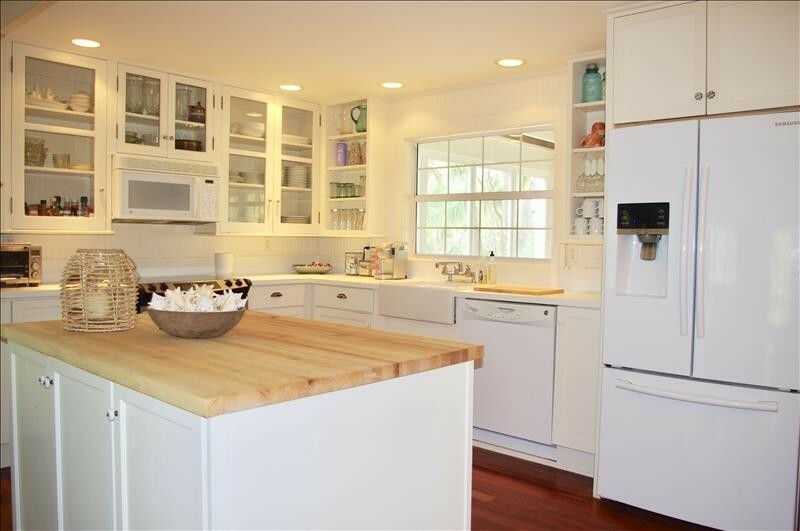 The kitchen features everything you could want, with beautiful farmhouse cabinetry, an island, modern applicances and more. 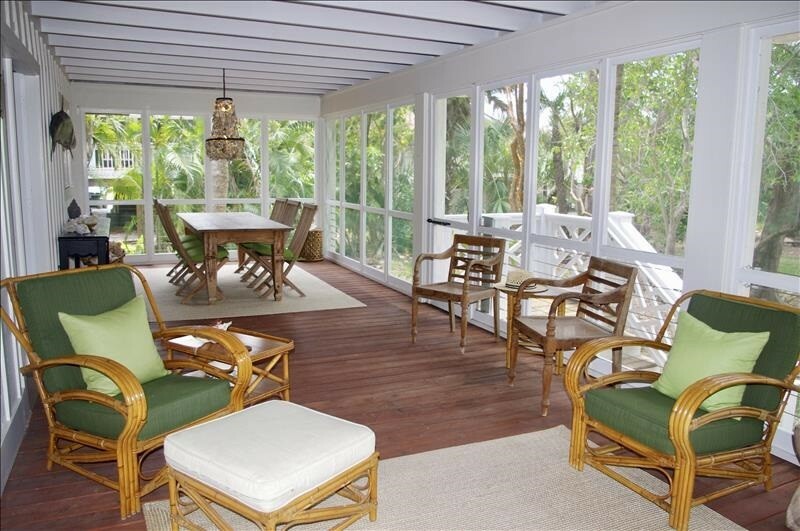 Just off of the kitchen is the screened porch, which is perfect for entertaining. The Balinese daybed is perfect to take a nap, stretch out with a good book, or to simply meditate and relax. 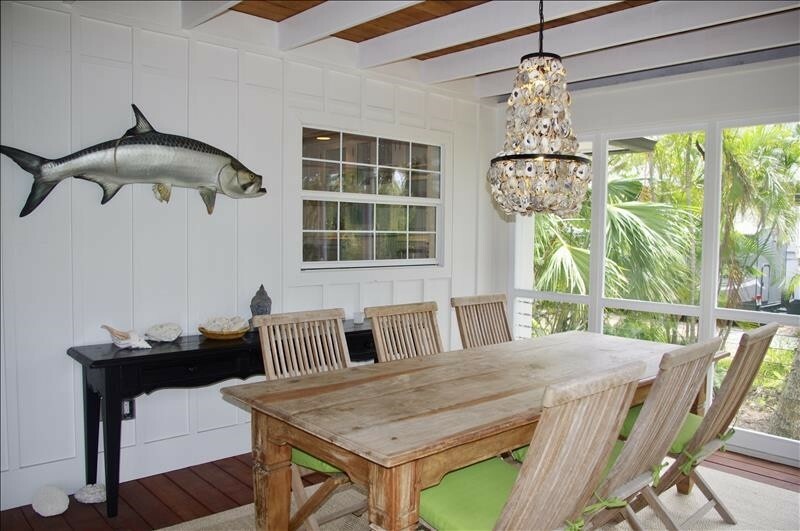 The porch features a beautiful oyster chandelier, a trophy mount of a Silver King Tarpon, and a dining table that easily seats 6 - 8. The master bedroom features a Queen bed, writing desk, television, and French doors that open to the screened porch. Enjoy cool winter breezes and the fresh air! 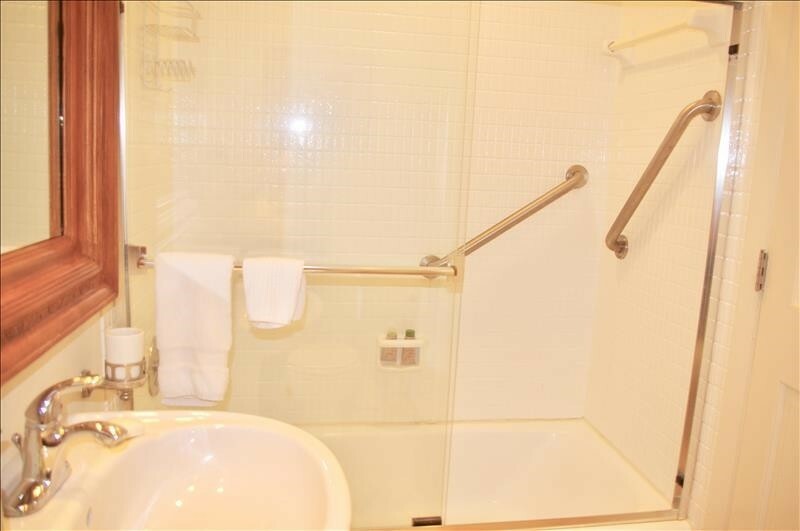 There is a small en-suite 3-piece bath with a pedestal sink and subway tile shower. The guest bedroom also features a Queen bed, armoire, closet and built-in bookcases that offer an endless array of reading opportunities. 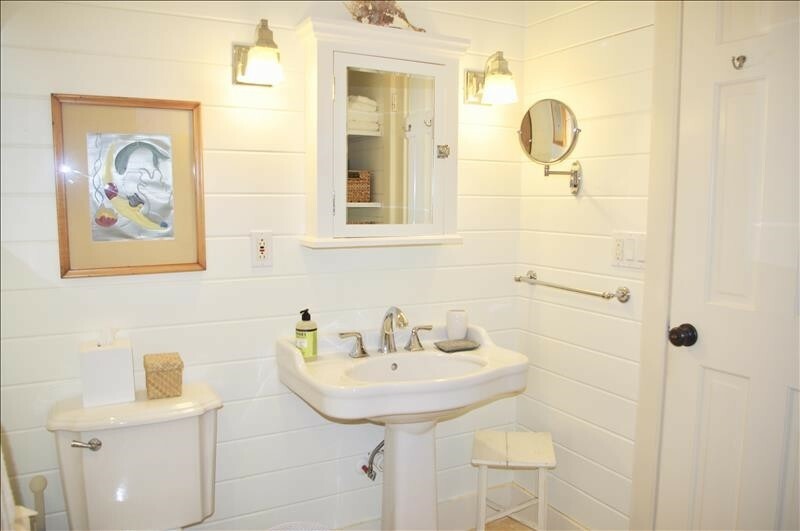 The guest bath is near to the living room and guest bedroom, and features a pedestal sink and shower. If you step outside to the back yard, there is a staircase that leads up to a private rooftop sundeck, featuring teak steamer chairs that are just right for sunbathing. There are several garden benches in the back yard as well, so if you have small children visiting or a doggie in residence, it's a perfect back yard play area. After a day at the beach, rinse off in the outdoor shower, right under the blue skies and palms. The Gulf of Mexico beaches are a 10 minute stroll or 4 minute bike ride from Miles Away, and many favorite local restaurants are nearby as well. A 28 night minimum stay is required at Miles Away, no exceptions. 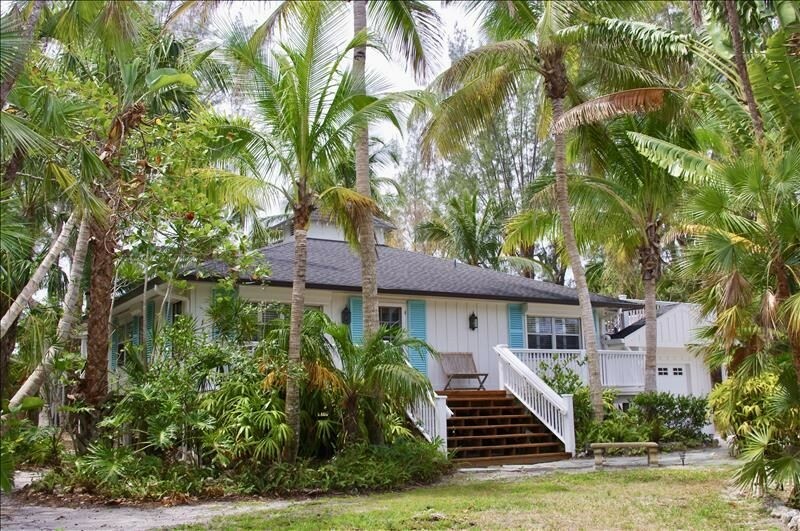 Miles Away is professionally managed by Cottages to Castles of Sanibel & Captiva. Since 1997, they've been making sure that you have everything you need to make your stay a memorable one. 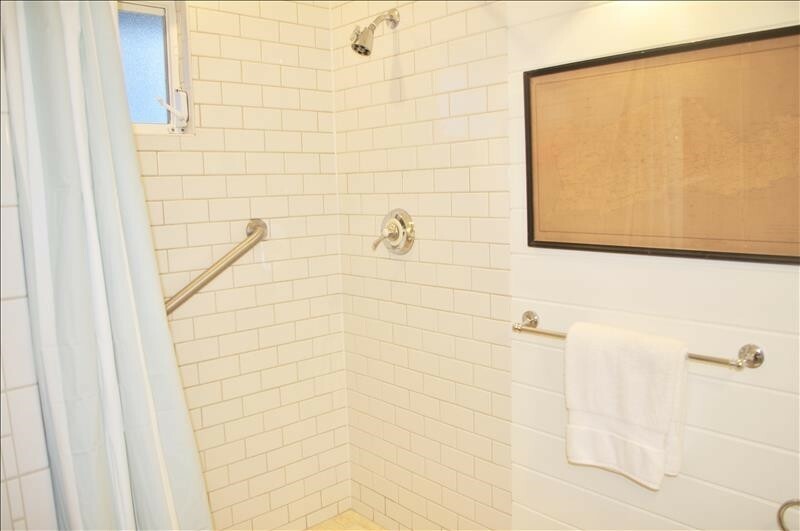 Your doggie is welcome at this property with prior approval of the Owner and Cottages to Castles. Payment of a non-refundable pet fee is required. The non-refundable fee is based on the length of your stay and the number of doggies in residence and/or visiting the property. Weight limit and breed restrictions may be applicable. Please contact me with information regarding Miles Away. Our month at Miles Away on Sanibel Island was very pleasant and enjoyable. 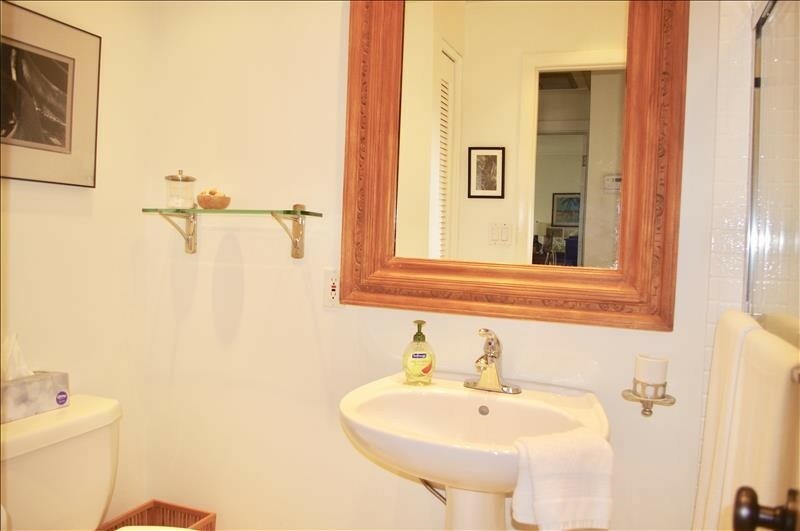 The home was exactly as pictured and described by Sharon and her staff at Cottages to Castles. From the very first day I felt like we were guests of a very welcoming family. Everything we would need for our stay was there. 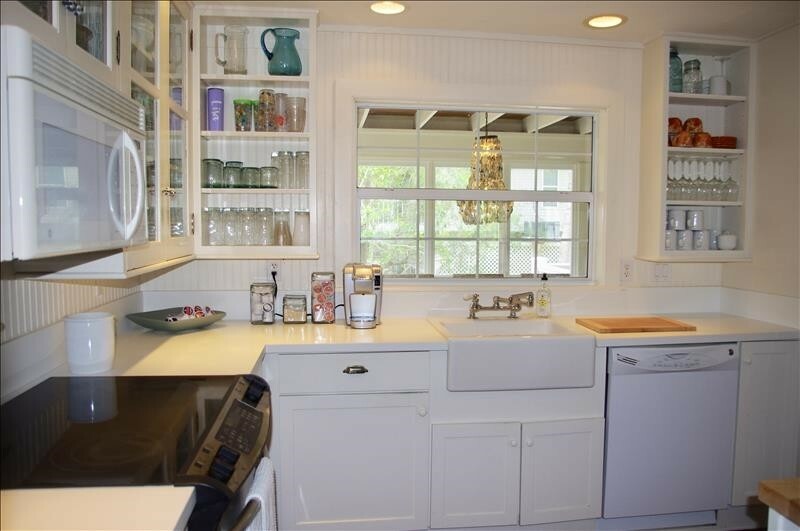 The kitchen was well appointed with all the utensils, dishes, silverware, etc we would need. The beds were comfortable and the linens were first class quality. Thank you for the attention to detail that you obviously put into your property management, we look forward to working with you in the future. And a special thank you to the Miles Away Owners for allowing us to be their very first rental clients, we tried to treat your home with the same respect we show our own homes.